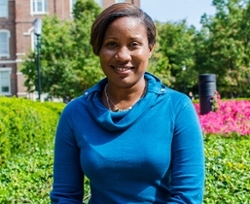 Natasha Duncan is a clincial associate professor in the department of political science at Purdue University. Natasha is also the advisor for Pi Sigma Alpha. She holds an undergraduate degree from City University of New York, Brooklyn College and graduate degrees (MA, PhD) from Purdue University. Prior to returning to Purdue as faculty, she was an assistant professor of political science at Mercyhurst University, Erie, PA, where she also served as the director of the Honors Program for 2013-2014 academic year. Dr. Duncan specializes in international relations and comparative politics. Her research broadly focuses on international migration. Her 2012 book, Immigration Policymaking in the Global Era: In Pursuit of Global Talent, examines high skilled labor migration and the role of immigration policy as a determinant in the movement of global talent. She has published work on high skilled labor migration, immigration policies in the facilitation of brain drains and gains, international migrant circulation, and naturalization and immigrant integration in the United States. She is currently working on research that examines the political consequences of emigration on countries of origin. Besides migration, Dr. Duncan has an interest in Caribbean politics. Within this area, her research focuses on democratic sustainability and integration.